Save Versus All Wands: Jack Vance Writing Contest! 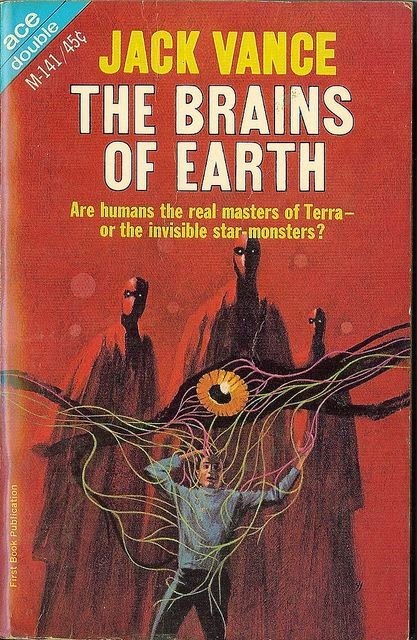 Calling all Brains of Earth! It's a Jack Vance writing contest! Compose a snippet in the style of Vance, most likely dialogue, but it doesn't have to be, and post it in the comments for this blog post. I'll judge the winner and he or she shall receive a Psychedelic Fantasies adventure PDF from RPGNow, either Proteus Sinking (reviewed in this space a few days ago), or another of your choice. Okay, the prize is not massive, but though I am a rich man in the ideal, my current account of terces is not extensive in the actual. According to the Gods, this is not atypical. Remind me to ask them about this sometime. "Your taste is exquisite," said Pantoflac. "My work is the toast of nine worlds. That I am wanted on eight of them is of no account." "No account?" said his companion. "No account to me," replied Pantoflac. "Nor to the universe, which I've found to be mute on such things. The true artist is above the material concerns of other men. Expend five terces to refill our flutes and I will elaborate on this theorem." “Not all so clever as that. In error I dropped my money pouch on the other side of the river. Did you see it?" “Ha ha!” cried the Dragonette. “I find this banter restorative.” And with a spring he was again in the air and quickly began to accelerate. “Then I will have to appreciate it at a distance,” she said laughing, and moved towards the two strangers who had just entered the room. Apologies if the above doesn't contain a high enough ratio of obscure or invented words. My brain doesn't work that way, and I let my subscription to the OED lapse due to the above mentioned temporary shortage of terces. It's for the fun of it. Good luck! And may the Grues remain distracted in your presence! Advice to potential competitors: Okay. So I think the proper psychological attitude to the above is to be INSPIRED by it, but then to forget about it completely. You still have a chance (said repeatedly and sort of hypnotically over and over again until you actually believe it). Also perhaps Perdustin will be called away and will not be able to actually claim his prize, etc. On that note, vfults, come forward! From the assembled villagers came gasps and cries of astonishment. The corner of Cugel’s mouth twitched involuntarily. The OSR Explodes Into the Mainstream!